Hey Mike! How the hell are you? I was wondering what happened to you, last I heard you were running the joust for REC at the NY Ren Faire and then I lost track. Sorry I didn't get a chance to come to Sonora (believe me I have take grief over that! ), but I have been nursing a broken hand since the Dragon's Lair World Championships and been doing shows almost every weekend since and have not given it time to heal. PM and give me a phone number, I'd really like to catch up and see what you have been up to. Okay, stating that I have never been stunned does not mean that it doesn't happen. I know that my brother-in-arms Rod will tell you an entirely different story from last year's Dragon's Lair tournament. It really all depends on how you land. At last year's Sonora Tournament, I went extra hard to try and take Shane Adams out of the saddle and, which usually happens when you try to hard, ended up putting myself on the ground. While I was not stunned, I apparently landed on a large rock that pretty much caved in my right elbow couter and I experienced "armour failure" as I blew a few straps. In battle, with a pretty much non-functioning right arm and pieces of armour that are no longer attached, I would pretty much be toast. Weekend before last at the Lanzefest, Eric had me test cut with the Duke from horseback on the tatami, it was awesome and now we are talking about doing some further testing with various weapons on different pieces of plate and chain. (see the Off Topic - King's Champions thread). Okay, I guess I should get back to work. Please post the results of your cutting tests in great detail. This would be of particular interest since these swords were used in that environment quite often, yet we see very little information about it. Maybe even a full length article for permanent inclusion in our features? I'd also like to thank you, and the others, for discussing your experiences with jousting and mounted techniques. I've been on a horse exactly twice in my life, so I find these discussions particularly informative. Wow, stay off the Computer for a few days, and all sorts of nifty stuff gets posted! Thank you, Gentlemen, for really good information! I guess the main point to be taken away from this entire thread is that indeed, Plate armour at least is very effective in helping to spread the impact of the ground flying up and hitting you! Among other things, that is. For those interested, there was a nifty article in the San Francisco Chronical about the jousting competition in Sonora last weekend. The reporter has a different take on it than I would, but what the heck, still fun to read about! Cheers, and thanks again to all who are posting to this. I just thought I’d mention that German Medieval Armies 1000 – 1300 by Christopher Gravett has a number of illustrations of the inside parts of shields. Some of the pictures of period manuscripts show the knights holding the reigns at the same time as their shield. There are a variety of strapping methods shown. Overall it is a good read too. It’s #310 in Osprey’s Men-At-Arms Series. Joseph, Thanks! I'll have to check that one out. I appreciate the update. BTW, hey Michael, I bought a new horse, a half-draft! Now I just have to teach him how to joust, play Cavalry, and darned near everything else I want to do with him, LOL! I have stumbled across this thread and enjoyed the reading. I'll go ahead and chime in one of my experiances of late and hopefully we can get some more experiances in here. I suited up and had my brother snap some good quality photo's of me in my armour. For a weapon, the only thing I have is a hatchet (not period or anything I know) However the hatchet is real and pretty darn tuff (I used it to hack off quite a few large tree branches) Well I wanted to see just how well my Armour would hold up. I was wearing my cuisse and arming leggings and I had my brother strike me with the hatchet on my cuisse. He pulled his hand back pretty far and did not hold back at all. He hit quite hard. I did not even recieve a bruise from the sharp edge of the hatchet hitting the cuisse. The impact was loud and forcefull, leaving a scratch and a decent size dent in the armour. My brother was so sorry and I told him it was ok, it shows the armour has been broken in sort to speak. Also my armour weighs in at 80lbs, I hae thrown myself to the ground and jumped right back up in ease. I found it interesting that the inital strength to get up was a bit hard, though as I got over that the armour seemed to actually help me roll to a standing postion. Further testing will need to be done. Yeah, sort of agree that it's not an example to follow but it's still a funny story since nobody got hurt, but even if the armour did it's job the axe could have slid / skated / ricocheted of the plate and hit a less well protected spot ! I have been wearing a shield on the shoulder quite a lot when figthing on foot, and have found that to have controll of it, the guige strap needs to be attatched so that it rests directly against your upper arm, rather than being attacthed at the front edge. Some depiced shields also have a long strap running along the front edge, that gives extra controll, while alowing arm movement. 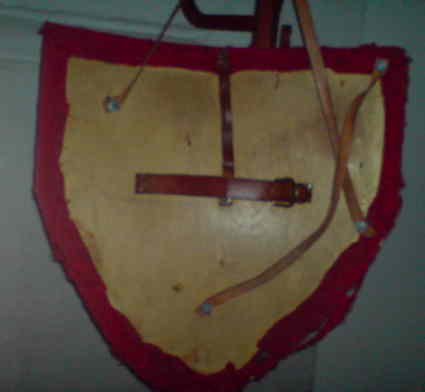 Some shields also have an horisontal strap for the upper arm, giving even more controll. Alternative handgrips for use while hanging on the guige is also quite common. However, there is a large variety of designs in the historical material, indicating that the placement of straps was pretty much up to personal taste. I've found getting tossed (in grappling - I don't do mounted work), etc in plate isn't all that much worse than the same throw unarmoured (though they tend to happen faster because of the ~3-6" increase in the height of your COG)... but you need to know how to take a fall in and out of armour. Depending on the harness, the ability to 'become round' that aids in safely rolling & falling while unarmoured can become very difficult. And in no way am I advocating that anyone else try this. I took a chance and the chance proved no injury, however there could have been injury. well, there is plenty of armour that shows signs of modification and repair during its life. I think you may be underestimating how much this stuff cost 'back in the day'. I've heard a full custom fitted suit of plate from the 15th C like those you see in the famous armouries (usually for extremely wealthy nobility) equated cost-wise to a high end sports car or even a private plane in the modern day. That was the price evaluation i was under. I also believe that The orgins of "keeping up with the jones" comes from the english knights that every time a new armour was seen on another knight, that was the new standard that the other knights tried to keep up with. I could totally be mistaken and if I am please correct me. that is what i hread a while ago. Must have been nice to be rich enough to have multiple sports cars- oh I mean suits of armour. A bit why I think older armour might still have been in use much later than it's period of original popularity but that what we see in period art is what the rich would have used in most cases. ( At least in portraits of individual knights or high nobles, one might notice some older armour in large battle scenes and where the older armour being show worn by the " evil Saracens " or " Philistines " in Biblical art where contemporary armour would be used by the artists ). A low status person: Mercenary, city militia, peasant revolts, soldiers with no social status reasons to " keep up with the Jones " would continue to use really old armour or mixes of old and new without worrying that they aesthetically don't look good together, or last year's model or even last century's model !? A knight, even a poor one, had to keep up with fashion to retain credibility and social status. Oh, I think that if one got a piece of armour seriously damaged one might replace the entire piece by having a very similar or identical one made but not get a whole new suit unless very VERY rich ! The damaged but still serviceable armour might be gifted to a retainer who would get it fixed and wear it or sell it if it was too small or big to be adjusted to their size ? I saw this video on youtube and thought it fit perfectly with the discussion. [url]http://www.youtube.com/watch?v=WMuNXWFPewg [/url] though the horse was not at full gallop and the guy fell deliberately it does show that one can recover if they control the way they fall (though a blunt lance delivered full force to the chest probably makes it harder to do). Also as many jousting professionals have checked this page where would you suggest a interested Canadian teenshould start? Now i have virtually no experience riding armored, but i can offer a bit of insight with one personal experience. I used to be quite the bowyer hobbyist and made a few horsebows (also called hornbows, composites) and in order to shoot whilst riding it was very important to have a horse that could be controlled by pressure applied by the heels. It could be challenging to shift weight, draw an arrow then knock and draw. Keeping balance in a corner was about shifting weight and not tightening legs because that would steer the horse off course. Although i should mention most well trained horse are observant enough to notice routine and when you shift your weight a certain way they are more likely to respond in ways that you have had them in the past. I imagine it would not be as much help in jousting, but it war where you need offense and defense i think it could help you avoid pikemen or obstacles and still be free to use your hands. It would be difficult to have a full calvery trained (horses and men) to be able to utilize hands free riding though, as well as saddles and recreations of saddles from the fifteen and sixteen hundreds would not lend them selves to large shifts in the saddle. I had an interesting experience at a demo the other night. I was in harness for the MC to discuss how armour changed the game of historical swordsmanship (and how it isn't like the movies). As part of this was the 'armour works!' demo. The MC (the head instructor) took a few swings at me with a blunt steel trainer (an albion lichtenauer, for reference), as well as thrusts and a a pommel strike to demonstrate that directly attacking the plate would not work very well. The cuts were all delivered with a quite a bit of force (certainly more than sufficient to have done me grave harm had I been unarmoured). Of course, all they did was make me go 'hey! I gotta polish that now!'. The head shot (he did warn me, kindly) rang my bell but was surprisingly only a slight annoyance. The crowd certainly didn't expect it, and were equally impressed when I was able to say it didn't hurt at all. Now, *I* knew armour works before that. But I hadn't really had it demonstrated to me quite so 'viscerally'. It reminded me of how some police departments and the armed forces will demonstrate (in a very similar way) that gas masks work.